Big Oil... pulls back the covers to expose a centuries-old cabal of global oligarchs, whose control over the global economy is based on hegemony over the planet's three most valuable commodities: oil, guns and drugs- combined with ownership of the world's central banks. Henderson implicates these oligarchs in the orchestration of a string of conspiracies from Pearl Harbor to the Kennedy Assassination to 911. 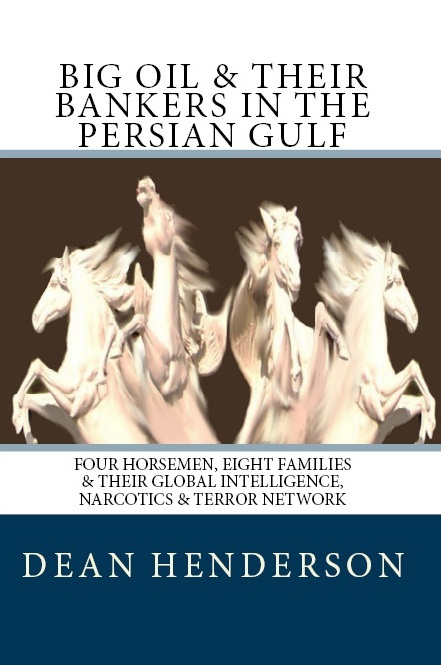 He follows the trail of dirty money up the food chain to the interbred Eight Families who- from their City of London base- control the Four Horsemen of Oil, the global drug trade and the permanent war economy. "Big Oil... is an extraordinary expose of the powers and events that are exacting a heavy toll on us, the people". - Nexus New Times Magazine. Australia. "Big Oil... is hair-raising and a masterpiece which deserves not less than the Pulitzer Prize in Journalism. This book should be a requisite for every American to study." - Dr. Carlos J. Canggiano, M.D., Juana Diaz, Puerto Rico.